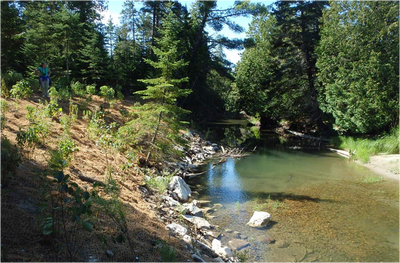 The Mindemoya Enhancement Strategy recommended that rehabilitation of site MIN 604 should include bank stabilization and enhancement of critical in-stream habitat. It is our intent to improve the stability of the sand bank and in-stream habitat by implementing a bio engineered site design. 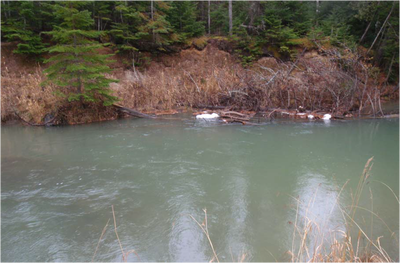 The site design for MIN 604 focused on bank stabilization and in-stream habitat. The sand bank at this site is approximately 18 meters long by 3.5 meters tall at its highest point. This is a critical spawning and nursery area as the culvert at Cranston Road prevents many fish from migrating further upstream. Special consideration was given to creating in stream habitat along this area. Community volunteers were used for riparian vegetation planting and weeping weir construction. Heavy equipment was needed for stabilizing the sand bank and enhancing the in-stream habitat. Stream restoration involved a variety of in-stream rehabilitation and bio-engineering techniques including; stabilizing the toe of stream banks with boulders, creating additional pool and riffle areas and placement of spawning gravel. 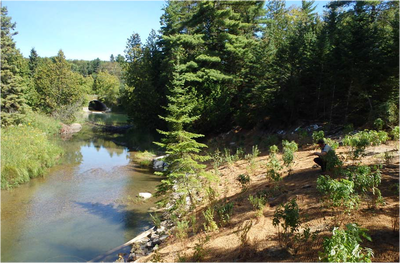 Proven bio-engineering techniques for riparian zone restoration was implemented to provide fish and wildlife habitat along the river edges. The riparian area was restored by planting native tree and shrub species such as eastern white cedar, speckled alder, heart leaved willow and native grass seed. This will provide shade to the creek so the water will stay cooler, which will help to maintain an ideal overall water temperature for all cold water biota as well as to provide future suitable shelter and shade for a variety of aquatic and wildlife species.